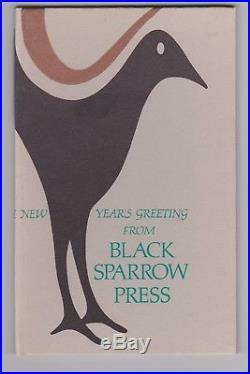 This is the 1983 Hardcover New Years Greeting from Black Sparrow Press featuring the Charles Bukowski poem SPARKS. Only 226 signed copies were printed, this one being #77. The chapbook is in near fine + condition and Bukowski used a nice thick marker for his signature. 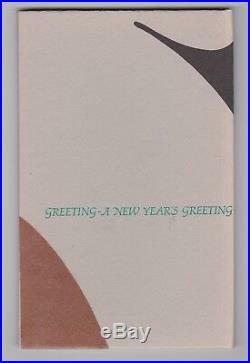 This is also one of the bigger New Years Greetings, measuring 8.5 x 5.5. I specialize in Charles Bukowski books only. Please see my other auctions and feel free to contact me to help you pick that perfect Bukowski present. I can also help you independently verify any of the items I sell so there will be no disappointments. 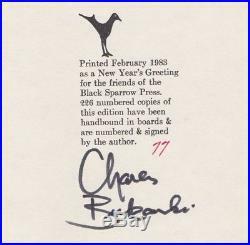 The item "SIGNED, First Edition (1/226) by Charles Bukowski" is in sale since Sunday, December 30, 2018. This item is in the category "Books\Antiquarian & Collectible". The seller is "sanfrancisco_mike" and is located in Charlotte, North Carolina.